'Inclusive Growth, Full Employment, and Structural Change: Implications and Policies for Developing Asia' discusses policies to achieve inclusive growth in developing Asia, including those relating to agriculture, investment, certain state interventions, monetary, fiscal, and the role of the state as employer of last resort. 'Inclusive Growth, Full Employment, and Structural Change: Implications and Policies for Developing Asia' discusses policies to achieve inclusive growth in developing Asia, including agriculture, investment, certain state interventions, monetary, fiscal, and the role of the state as employer of last resort. 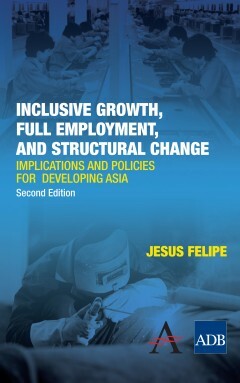 Felipe argues that full employment of the labor force is the key to delivering inclusive growth. Full employment is the most direct way to improve the well-being of the people, especially of the most disadvantaged. Since unemployment and underemployment are pervasive in many parts of the region, Asian leaders must commit to the goal of full employment. The book also analyzes the region's phenomenal growth in recent decades in terms of structural transformation. Accelerating it is vital for the continued growth of developing Asia. But efforts to achieve full employment might be held back given that structural transformation requires massive labor shifts across sectors, and these are difficult to coordinate. Moreover, the goal of full employment was abandoned in the 1970s, and governments and central banks have since concentrated on keeping inflation low. Jesus Felipe is Principal Economist with the Central and West Asia Department of the Asian Development Bank, Manila, Philippines. His books include 'Labor Markets in Asia: Issues and Perspectives' (London, 2006).